What Are The Rules to Video Poker? - Casino Answers! Casino Answers » Casino Game Rules » What Are The Rules to Video Poker? What Are The Rules to Video Poker? Royal Flush: A hand with the ten through ace all in the same suit. Like this: :ts::js::qs::ks::as: Pretty, isn’t it? Alright so that’s poker hand rankings for you. Lets talk about how that works in relation to video poker. 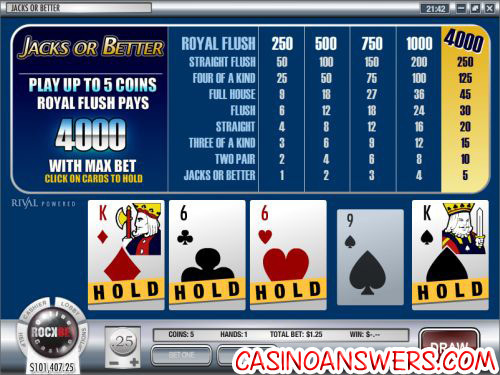 The fundamentals of all video poker games are the same, although the payouts are different. First here’s how video poker actually works. You put in your bet. You click “Deal”. You get dealt five cards. You choose to either discard cards or hold cards. You can discard up to all 5 cards, and can hold all 5 cards. If you discard any cards, you are provided replacement cards. At this point, depending on your hand, you either win or lose. Simple, huh? Lets take the most common video poker game, Jacks or Better Video Poker. The way you win with Jacks or Better Video Poker is just as it sounds – you have to get a pair of jacks or better. A pair of 9s? You lose. High card? You lose. So as you can see in the above hand, we’ve been dealt two pair immediately. So we choose to hold the two pair, and we would then draw for the next card. That’s it – that’s all there really is to video poker. Now what you should know is that there is a LOT of different versions of video poker. That’s one of the best things about video poker, there’s so many variants of it, and so many crazy ways to play. However at the end of the day the fundamentals are all the same, and it’s usually just a case of additional bonuses, wildcards and difference on payouts. For a wide variety of video poker games check out Cherry Red Casino. How do you play video poker? Where can I find video poker rules online?